Synthetic peptide corresponding to Human MEIS1 aa 200-300 (internal sequence) conjugated to keyhole limpet haemocyanin. 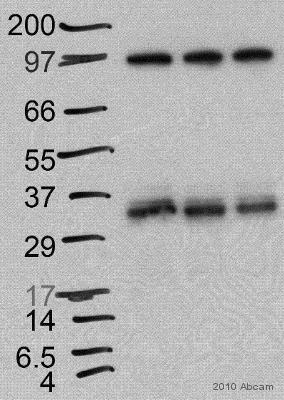 This antibody gave a positive signal in the following nuclear cell extract: KG-1. This antibody gave a positive signal in the following FFPE tissue: Human tonsil, and Rat normal brain. For a detailed method for MEIS1 ChIP-seq in RA-treated P19.6 cells, please see the protocol described by Dr Aurelien Serandour at http://www.ncbi.nlm.nih.gov/geo/query/acc.cgi?acc=GSM819083. Our Abpromise guarantee covers the use of ab19867 in the following tested applications. WB Use a concentration of 1 µg/ml. Detects a band of approximately 40, 48 kDa (predicted molecular weight: 43, 50 kDa). Abcam recommends using milk as the blocking agent. Expressed at low level in normal immunohepatopoietic tissues, including the fetal liver. Expressed in a subset of myeloid leukemia cell lines, with the highest expression seen in those with a megakaryocytic-erythroid phenotype. Also expressed at high levels in the cerebellum. Defects in MEIS1 could be a cause of susceptibility to restless legs syndrome type 7 (RLS7) [MIM:612853]. Restless legs syndrome (RLS) is a neurologic sleep/wake disorder characterized by uncomfortable and unpleasant sensations in the legs that appear at rest, usually at night, inducing an irresistible desire to move the legs. The disorder results in nocturnal insomnia and chronic sleep deprivation. Lanes 1 - 3: Merged signal (red and green). Green - ab19867 observed at 48 kDa. 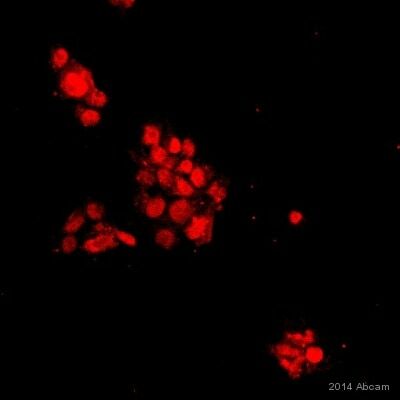 Red - loading control, ab130007, observed at 130 kDa. ab19867 was shown to recognize MEIS1 in wild-type HAP1 cells as signal was lost at the expected MW in MEIS1 knockout cells. Additional cross-reactive bands were observed in the wild-type and knockout cells. Wild-type and MEIS1 knockout samples were subjected to SDS-PAGE. Ab19867 and ab130007 (Mouse anti-Vinculin loading control) were incubated overnight at 4°C at 1 μg/ml and 1/20000 dilution respectively. Blots were developed with Goat anti-Rabbit IgG H&L (IRDye® 800CW) preabsorbed ab216773 and Goat anti-Mouse IgG H&L (IRDye® 680RD) preabsorbed ab216776 secondary antibodies at 1/20000 dilution for 1 hour at room temperature before imaging. IHC image of MEIS1 staining in Rat normal brain formalin fixed paraffin embedded tissue section, performed on a Leica BondTM system using the standard protocol F. The section was pre-treated using heat mediated antigen retrieval with sodium citrate buffer (pH6, epitope retrieval solution 1) for 20 mins. The section was then incubated with ab19867, 0.5µg/ml, for 15 mins at room temperature and detected using an HRP conjugated compact polymer system. DAB was used as the chromogen. The section was then counterstained with haematoxylin and mounted with DPX. Observed band size: 40,48 kDa why is the actual band size different from the predicted? This antibody was raised against an immunogen that is predicted to recognize isoforms 1 and 2 of MEIS1. The predicted molecular weights of isoforms 1 and 2 are 43 kDa and 50 kDa respectively. Abcam recommends using milk as the blocking agent. Abcam welcomes customer feedback and would appreciate any comments regarding this product and the data presented above. Publishing research using ab19867? Please let us know so that we can cite the reference in this datasheet. I filled out the questions the best I could, I hope you can find some conditions I could improve. No positive control taken along, but same prot. Lysates were used for other blots, and showed no signs of degradation. See result in included picture, longer AB incubation results in more aspecific bands; and no band at the expected size. Thank you for taking the time to complete our questionnaire and contact us. The details you have kindly provided will enable us to investigate this case for you and this is also helpful in our records for monitoring of quality. 1. I am sorry I am not able to trace this order number on our system, and there are no orders from the Netherlands in March or April this year. Please confirm if the product code is correct (ab19867 Anti-MEIS1 antibody - ChIP Grade) and please provide the name and address of the institution where the order was placed from. If you ordered from a purchasing agent somewhere else, then they should have the Abcam order reference number. 2. We recommend to store antibodies as directed on the datasheet so that they will remain stable and that we can continue to provide our guarantee. If addition of glycerol is required, this will be mentioned on the datasheet. For future reference, this antibody should be aliquotted and stored as it is, as directed on the datasheet. Extra glycerol is not required in this case. Storing an antibody at lower concentrations can affect its stability. 3. I can recommend to lyse the cells in RIPA lysis buffer, which should provide a more suitable protein preparation. Once the lysate is prepared, you can then add sample buffer including reducing and denaturing agents, and heat. 4. What dilutions of antibody have been tried? To reduce the background, I c an recommend to try reducing the concentration of antibody. Incubate overnight at 4oC, which can provide more specific and efficient staining. 5. I can recommend to add a wash step after the primary antibody incubation which will help to wash away any excess antibody. 6. Could you confirm the current vial of secondary antibody is working well with other primary antibodies? I suggest it would be beneficial to include a no primary control to assess if the secondary antibody is binding non specifically. It may be that the concentration of secondary antibody needs to be reduced in order to help optimize the results. 7. We recommend not to mix blocking agents in an experiment, it can sometimesaffect the results. Try 5% BSA only. 8. Has the quality of the sample and transfer to the membrane been assessed using a loading control? Several tests have been performed to perform westernblot using this AB, but so far we have been unable to get the proper band in sight. I would like to reassure you that this antibody is tested and covered by our 6 month guarantee for WB and Mouse, Human and Zebrafish samples. In the event that a product is not functioning in the tested applications and species cited on the product data sheet (and the problem has been reported within 6 months of purchase), we will be pleased to provide a credit note, free of charge replacement or refund. I would like to investigate this particular case further for you, and also obtain more information for our quality monitoring records. In order to proceed with this,it would be helpful tohave some further information and I have enclosed a technical questionnaire below. I would appreciate if you could complete this. It will help you put the information we require together very easily. I am very pleased to hear you would like to accept our offer and test ab19867 in Axololt. This code will give you 1 freeprimary antibodybefore the expiration date. To redeem this offer, please submit an Abreview for Axololt and include this code in the “Additional Comments” section so we know the Abreview is for this promotion. Please remember that submission of the Abreview is sufficient for the discount code to become active.